Om. May there be happiness and goodness.The Venerable Lama Kalu Rinpoche is the true meaning of Great Dorje Chang — embodying his outer, inner, and secret qualities and activity in a manner we ordinary beings can perceive according to our capacities. I have felt a great need for his life story to be written, and great hope that it could be done. Rinpoche has now given us, his followers and disciples, his permission to write it. If the biographies of the holy beings in this world are not clearly told, it is our great loss. Thus I pray that you will bear this in mind. Before I now recount something of what I myself have seen and heard, I must beg not only permission of the lamas and the dakinis, but also their forgiveness for any illusions arising in my mind through my impurity. There are both the stories of the former lives and the story of the present life of this venerable lama’s essence. Of the many miracle wisdom emanations of Jamgon Kongtrul Rinpoche, Gyalses Lodrotaye, he is recognized as the Activity Incarnation to subdue beings. Jamgon Kongtrul Rinpoche was previous incarnated as the Buddha’s closest disciple, the Arhat Ananda. He was the great translator Vairocana; he was the learned and accomplished Khyungpo Naljor; he was Sakya Pandita, Jonang Taranata, and Rikdzin Terdak Lingpa. Their mind stream was all one emanation, prophesized by Lord Buddha in the Samadhiraja Sutra and the Mahaparinirvana Sutra, and prophesized by Urgyen Chenpo Padmasambhava in many treasure books. Jamgon Kongtrul was born in Derge in Do-Khams. From Sechen Pandita Gyurme Thutop Namgyal, from the All-Seeing Jamyang Khentse [Khyentse] Ongpo [Wangpo], and from his root lama the extraordinary Situ Pema Nyinche, and from more than fifty other teachers, he received the great intellectual ocean of Sutra and Mantra teachings, which he fully heard and contemplated. In his meditation experience, he vividly received the heart sign of accomplishment. His works include The Treasury of All-Pervading Knowledge, The Treasury of Tantric Teachings, The Treasury of Whispered Teachings, The Treasury of Precious Treasures, and the Extraordinary Treasury with its included Treasury of Vast Teachings. Through his continual ripening and liberating work in compiling these, The Five Great Treasury volumes, he resuscitated doctrines of the Old, New, and Eclectic traditions which were on the point of perishing. He accomplished great benefit to the Doctrine and to sentient beings. At age eighty-seven he passed into the space of peace. There remains a sizeable biography of him. 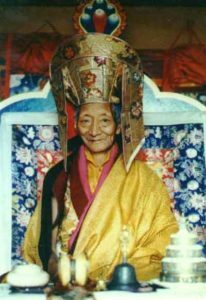 The present incarnation, Kalu Rinpoche, was born into the Ratak family of Beru, in Hor Treshe. Ratak Tulku, named Pema Norbu, was a disciple of both Jamyang Khentse and of Kongtrul Rinpoche. To this Holder of the Clarity of the Secret Tantras, Rinpoche was born as a holy son, in the Female Wood Snake year. To his venerable father himself came many dream signs that Kalu Rinpoche was an incarnation of Kongtrul Rinpoche. In particular, the fifth Dzokchen [Dzogchen] Rinpoche, Tubten Choskyi Dorje, presented many spiritual offerings, three holy objects, an excellent horse, and other offerings. He told Ratak Tulku there was no doubt that his son was Jomgon Kongtrul’s incarnation, and that he should be offered to the Dzokchen Monastery. Ratak Tulku did not agree to this, but kept the presents. Rinpoche said that the horse was of great benefit to him, and that he rode him everywhere. From childhood Rinpoche was unlike other children. Everyone found him attractive. He had devotion and renounced all worldly interests. He had great compassion and intelligence. From his venerable father and others he learned writing, spelling, puja, Dharma activity and other things by memory. By the power of his perfect memory he was able to learn forty pages a day by heart. At about the age of fifteen, he went to the great Kagyu seat, Pepung [Palpung] Monastery, where he was taken into the compassionate care of Situ Rinpoche, Pema Ongchuk Gyalpo, who proclaimed him as a wisdom emanation of Jamgon Kongtrul. He was instructed in the various branches of learning and in the practice of the Sutra and Mantra teachings by Jomgon Kongtrul’s true disciples, Kes-ong Tashi Chospel and others. From the richly accomplished meditation Master Norbu Dundrub, he received the complete ripening and liberating doctrines of the Karma and Shangpa Kagyu. From Situ Rinpoche, Gyalses Khenste Ozer, Pepung Khenste Rinpoche and many other teachers he continuously and completely received teachings of the Five Great Treasuries. After completing the three year, three month retreat in the Pepung Meditation Hall, he went to Bengen Monastery in Hor, his homeland. 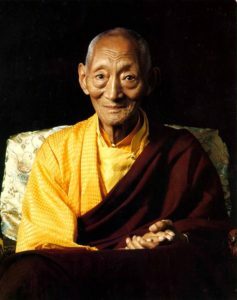 Beginning at age twenty-five, Rinpoche spent thirteen human years wandering in solitude among many uninhabited meditation spots. Enduring hardships, with great energy he completed preliminary practices of purification, and the main practices of arising and fulfillment meditations. The fame of his accomplishment spread in all directions. At the order of Situ Rinpoche, he was appointed Vajra Master of the Great Meditation hall of Pepung Monastery, where for many years he continually gave ripening empowerments, liberating teachings, and indispensable scriptural authority, and created many accomplished disciples. Rinpoche went on a pilgrimage in the area of U, Central Tibet. At the same time Situ Rinpoche Pema Ongchuk Gyalpo came on pilgrimage. At Situ Rinpoche’s order, Rinpoche taught the entire ripening and liberating Six Doctrines of Niguma of the Shangpa Kagyu to the great incarnate Gelugpa Doctrine-Holder, Kar Dor Rinpoche, and to Lhatsun Rinpoche and many other Gelugpa geshes, from whom he received vast offerings made in great reverence. At the Jokang Temple in Lhasa, Rinpoche made great offerings of gold before the Sakyamuni image, and made a great number of recitations of the “Virtuous Conduct” prayer. While he was on pilgrimage to circumnambulate the holy spots in U, Tsang, and Ru-shi, Rinpoche stayed at the home of a rich patron in the Kyangtsi area. In a dream a white skinned boy appeared before him and said, with great sadness, that he was Khyungpo Tsultrim Gonpo, but that in this Age of Darkness he could benefit neither the doctrine nor sentient beings. Rinpoche dreamt that in his own robes he had a tigug knife and a skull bowl. These he took out and gave to the boy, and said, “If you will be inseparable from these implements, you will accomplish your purpose. You need not worry.” The next morning he saw a son of the family who was really identical with the boy in the dream. Rinpoche told the parents without doubt that this son was a holy being and that he should be treated with great purity and entered into the door of the Dharma. The parents were greatly pleased and Rinpoche gave the child empowerments and ordination. While at the seat of Jetsun Taranata, the Gadon Puntso Ling in Tsang Lha Tser, Rinpoche gave a great assembly of monks the complete empowerments, teachings, and scriptural authority for the Six Doctrines of Niguma. They gave him great offerings. When Rinpoche was in Lhasa, Radreng Trichen and many other people seemed to request deep spiritual teachings from him. But Situ Rinpoche told him it would be better not to stay there. On this advice, Rinpoche departed in company with Situ Rinpoche’s messenger and returned to Kham. Rinpoche has made one hundred million recitations of the Six-Armed Mahakala mantra. And all together, over three hundred thousand recitations of the “Noble Virtuous Conduct” prayer have been made, including those recited by Rinpoche himself and those sponsored by him with offerings. What wonderful deeds these are! Holy beings accomplish benefit to the Doctrine and to sentient beings by three cycles: the cycle of reading, hearing, and thinking; the cycle of total concentration; and the cycle of activity. A small part of Rinpoche’s cycles we have explained here. Consequently we know that the qualities on his stream of being’s experience and knowledge are truly incomprehensible. But being a great “silent yogi”, he has guarded the secrets of his meditation, and these secrets we have not seen or heard. Yet we know that where there is smoke, there is fire, and where there is moisture, there is water. In a dream Rinpoche met the Lord Buddha and his eight close disciples, and dreamt that he offered the Seven Branches Prayer. Again in a dream, he himself truly transformed into Urgyen Guru Rinpoche, and from twelve tsan-ma goddesses and other dakinis received musical offerings of sweet songs and prayers. Born as a beggar’s son. Ripening and liberating many beings. In Samsara to be born no more. By the cycle of his activity Rinpoche rebuilt the old meditation hall of Jamgon Kongtrul at Pepung into a fine structure, made new with canopies and hangings of brocade, and umbrellas and victory banners. He put much money and goods into a fund to maintain the monks in retreat. 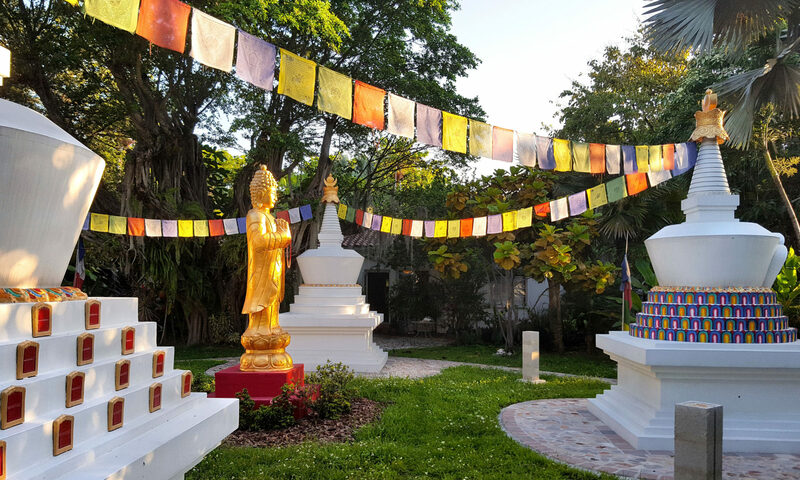 To help Situ Rinpoche construct a Maitreya and other images for their temple, Rinpoche traveled throughout Hor raising funds, and made great offerings of brocade, money, and many sacks of grain. Before his own root lama, three times he presented mandala offerings of absolutely everything that he owned. While in Tibet, wherever this lama was he had constructed thousands of mani-stones, chortens, tsa-tsa’s and large prayer wheels. He had no ego attachment to his own possessions. When many Tibetan people escaped to India in fear of the Chinese Communists, he established two meditation halls in Bhutan. He established five meditation centers in India. Then at Sonada he taught three successive retreats at his meditation hall. He established Naro Ling and Nigu Ling in France and began the opening of the door to tantric accomplishment in the foreign countries of the world. He has established many Dharma centers and continues to establish more. We should only increase our confident devotion to the Bodhicitta and supreme deeds of this great Bodhisattva. Whoever has the karma and good fortune to have strong feelings for the Holy Dharma should take the precepts and three ordinations from this venerable precious lama, and then devote his [/her] life to accomplishment. Or next best, do the three year three month retreat. Or next best, do a retreat of some years or months to obtain experience of Dharma. Or next best, at least take refuge and precepts and the empowerment of the Great Compassionate One. If one then practices the meditation of the Great Compassionate One even once, then one’s existence will have some meaning, and one will truly have some meaning, and one will truly have done oneself a great kindness. Therefore, please take this to heart. Good fortune! Happiness! Written by the one named Dezhung Lungriks Tulku, who has been saved by the nectar spoken by the Protector Venerable Kalu Rinpoche. May all we sentient beings be blessed. 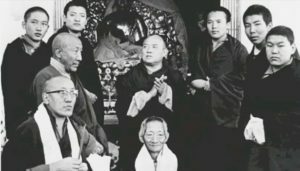 by The Venerable Dezhung Rinpoche, reincarnate lama of the Sakya sect, was revered among Tibetan lamas as one who truly embodies “the wisdom of Manjushri and the compassion of Chenrezig. Renowned for his comprehensive learning and accomplishment of all lineages of Tibetan Buddhism, he resided at Bodhi House in Long Island, N.Y. until his Parinirvana.